If he’s not on a flight……he is in flight….on his two feet…….! 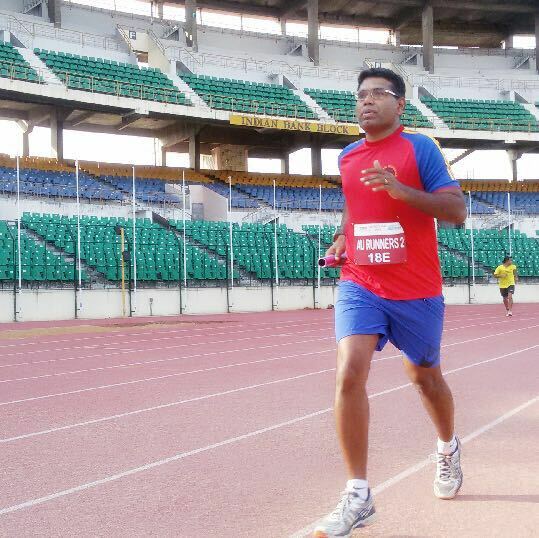 With a travel schedule that could hold a candle to NAMO’s, Dinesh Victor manages to keep up with his training and practice to turn out stupendous runs at every event he chooses to be a part of. Having attempted and successfully completing his first full marathon back in 2012, he has now been a part of many marathon events. Dinesh has achieved personal bests of 4:58 for the full marathon and 2:13 for the half. He also recently breached the sub 1 hour barrier in a 10 K event. Very well read and always informed, he can regale with a host of anecdotes and trivia on subjects ranging from world affairs to the world beyond….! An erstwhile banker, he now successfully runs his own enterprise involving his passion for teaching young kids. An important member of the DR Trust, he brings a whole lot of expertise in finance and management which helps run the trust and it’s events in a professional and diligent manner.